Hartland Abbey, with its dignified rooms steeped in history and its beautiful gardens and grounds leading to a remote Atlantic cove, is licensed for civil ceremonies. In its magical setting, this North Devon venue provides a romantic and beautiful setting for your very special day. There is an abundance of good accommodation nearby ranging from hotels, B and Bs, holiday cottages and large houses to rent, some of which is within walking distance. Couples are able to choose from five different venues. The magnificent Victorian Drawing Room, with its linenfold panelling and stunning murals of historical events, is licensed for up to 70 people. It was designed by Sir George Gilbert Scott, the eminent Victorian architect, for Sir George Stucley MP in 1850; he was inspired by The Robing Room in the Palace of Westminster. There is a Grand Piano by Bechstein which can be used and a log fire for cold days! 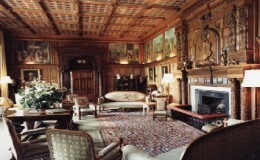 The Billiard Room, no longer for playing billiards, is a light and airy Georgian room in pale blue, hung with family portraits and was once the entrance hall. It is dominated by a large stone fireplace, made from Maltese stone brought back to Hartland Quay in the 1850s by Sir George Stucley in his yacht and carved on site. Being east facing, it is a particularly good room for morning ceremonies. Mario Testino filmed in here for American Vogue. The Billiard Room is licensed for up to 40 people. The Library with its Strawberry Hill Gothic design and fabulous ogee fireplace by Batty Langley faces west towards the sea and overlooks parkland. It is a beautiful pale green Regency room with Gothic bookshelves, a fabulous ogee shaped fireplace and many family portraits. It is an intimate and friendly room used by the family on a daily basis. It is licensed for up to 15 people. The Summerhouse in the 18th century Walled Gardens looks over beautiful beds of roses, herbaceous and tender plants and climbers, featured many times in garden magazines and books. Mario Testino also used this setting for a feature in American Vogue. There is a natural ‘aisle’ leading from the gardens below, through two arched doorways, echoing the past. 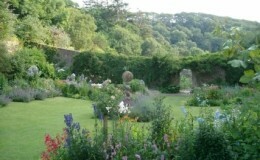 The Walled Gardens are pretty from spring onwards but we cannot guarantee the weather! The Summerhouse is licensed for up to 12 people. 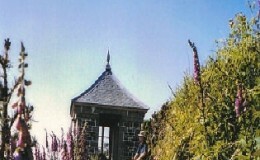 We also hold a licence for ceremonies in the tiny Gazebo overlooking the Atlantic. It is perched on the side of a hill with stunning views out to sea. It is approached by car or on foot along a track from the Abbey and thence by foot up a zig-zag path. It is a stunning venue for a very quiet and intimate ceremony. The Gazebo is licenced for 6 people but many more guests can line the path leading to it. Wedding receptions can be held in a marquee on the lawns beside the Abbey or elsewhere on the estate. We have hosted Humanist Weddings by the beach and in the gardens. Car parking can be very close to the house and in good weather helicopters can land nearby. Please contact Lady Stucley on Tel: 01884 860225 or email ha_admin@btconnect.com for a wedding pack or to arrange an appointment to view.